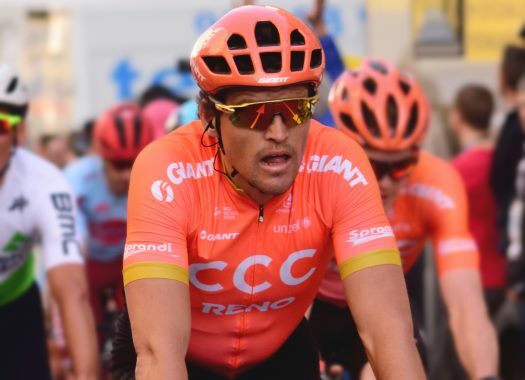 Greg Van Avermaet (CCC Team) has taken the victory of the third stage of the Volta a la Comunitat Valenciana. The Belgian was the strongest at the uphill finish in Chera. The third stage of the Spanish race was 194.3 kilometres long between Quart de Poblet and Chera with a hilly course suitable for the puncheurs. The escape of the day was formed just after the first 20 kilometres of racing and included riders like Awet Gebremedhin (Israel Cycling Academy), Diego Rubio (Burgos BH), Julien Duval (AG2R La Mondiale) and Preben Van Hecke (Sport Vlaanderen Baloise), among others. The escape group was caught by a motivated peloton pulled by teams like Dimension Data, CCC and Movistar at 10 kilometres from the finish. Mitchelton-Scott and Bahrain-Merida took control of the front of the peloton at the last part of the stage. Astana's Luis Leon Sanchez took the lead in the last curve, but CCC's Greg Van Avermaert showed his strength and overtook him, taking with him the winner of the second stage Matteo Trentin (Mitchelton-Scott). The speed of the Olympic champion was too high for the competitors and he crossed the finish line just ahead of the European champion and Sanchez. World champion Alejandro Valverde (Movistar) and Jumbo-Visma's Mike Teunissen completed the top five of the day. Edvald Boasson Hagen (Dimension Data) managed to keep the lead of the overall classification at the end of the day.